Jim Richardson has a rare story to tell. He has been air lifted by the Cornwall Air Ambulance on two occasions, for different incidents. The first incident was 14 years ago, when Jim contracted pneumonia and pleurisy, a condition in the lungs causing a build up of liquid and severe pain. The doctor called for an ambulance. The air ambulance were deployed due to Jim being unable to lie down for extended periods of time and the helicopter could get him to hospital as quickly as possible. Jim was air lifted to Royal Cornwall Hospital in Truro where he underwent tests. Jim’s second incident was in March of 2016. He was chopping some wood with his chop saw when he had an accident which has changed his life. Jim’s hand was sliced across three of his fingers. Esther called for an ambulance, and within minutes a first responder was on scene. She assessed Jim’s hand and told him he would likely lose the damaged fingers. Due to the extent of the damage and blood loss, it was determined the air ambulance would be needed to get Jim to the hospital quickly to save as much of his hand as possible. 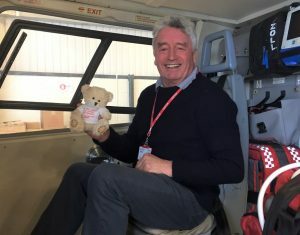 Jim went into shock before the air ambulance arrived, so the first responder started driving him to Derriford Hospital. The air ambulance met them on Davidstow airfield, where Jim was transferred to the helicopter and taken straight to the hospital. A specialist hand surgeon was waiting for them on their arrival, and Jim was assessed straight away. ”The surgeon was confident he could save most of my hand, and I went into surgery soon after.” said Jim. Jim had to have two four-hour operations on his hand and spent a total of five days in hospital. The damage to his hand was severe and he is left with his index finger shortened, and a large amount of scar tissue restricting his movement. However, he is still able to work with his tools and has recently been helping his daughter and her husband renovate their house.